A symbol of power, divinity, war, and justice, the eagle has been one of the most dominant birds in the human imagination for millennia. 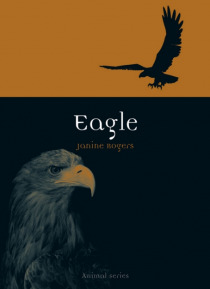 Exploring the rich history of this bird and its portrayal in art, film, literature, and poetry, this book examines how eagles became an emblematic creature that also embodies the paradoxes of our existence.�����������Janine Rogers reveals that while humans associ… ate eagles with light and learning, they also connect the birds to death and corruption. Eagles adorn flags, crests, and other emblems, but as she shows, they have also been relentlessly persecuted and perceived as predatory threats to livestock. While considering these contradictions, Rogers argues that eagles have suffered from the effects of human activities for years, from pesticide use to habitat destruction and global warming. She demonstrates the dangers of not saving eagles from destruction, as they are key to controlling pest populations and clearing carcasses. Featuring many illustrations of eagles in the wild, art, and popular culture, Eagle shines new light on our complex relationship with these birds, their international significance, and the dire implications of losing them to contemporary ecological threats.